Amtrak's Empire Builder train service carries passengers through the northern section of Montana's Glacier Country and is a relaxing way to see the stunning terrain. Amtrak operates daily from Seattle and Portland, as well as Minneapolis and Chicago, making stops in Browning, Cut Bank, East Glacier, Essex, West Glacier, Whitefish and Libby. Hop aboard, sit back and enjoy the view as you rumble past Glacier National Park, through the Rocky Mountains and across golden prairies. Just 25 minutes west of Cut Bank you'll find a monument honoring early explorer Meriwether Lewis, memorializing his search for a pass through the Rocky Mountains. This area is often noted for the coldest mid-winter temperatures in the country. From the trail, you'll be able to see views of the Rockies, Sweetgrass Hills and even the Canadian border. Community highlights include Glacier County Historical Museum and the Cut Bank International Airport. Headquarters for the Blackfeet Nation, Browning is located on the rolling foothills just east of Glacier National Park. Each summer the community hosts North American Indian Days, one of the largest gatherings of United States and Canadian tribes celebrating the Native way of life. Additional community highlights include the Museum of the Plains Indian, Lodgepole Gallery & Tipi Village and The Blackfeet Heritage Center. Built in 1913, this stop in East Glacier is located across from Glacier Park Lodge. The lodge was built by the Great Northern Railway to promote rail travel and to attract tourists to this beautiful corner of Montana. The empire builder follows the "mystery pass" through the Rocky Mountains sought by Lewis and Clark and established by John Stevens in 1889. It's here that you cross the Continental Divide at 5,216 feet. Look for a monument to President Theodore Roosevelt. Home to the Izaak Walton Inn, Essex is a flag stop for Amtrak. Originally housing snow-removal crews for the Great Northern Railroad, today the inn is a popular year-round stop for visitors, especially railroad buffs and cross-country skiers. This stop, the Belton, is located in West Glacier at the western entrance of Glacier National Park. Located across from the railroad depot is the historic Belton Chalet. 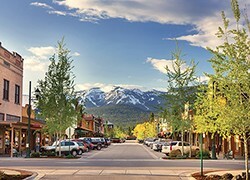 Located in downtown Whitefish, this alpine-style station welcomes visitors to its vibrant community and its nearby Whitefish Mountain Resort. This western resort town is an ideal four-season destination, providing stellar skiing, snowboarding, water sports, hiking, biking, theater and award-winning restaurants. Amtrak services this northwest Montana community—an incredible gateway to the quiet corner of Montana, and an area rich with outdoor recreation. Community highlights include Turner Mountain Ski Area, Libby Dam, the Cabinet Mountains Wilderness and the Kootenai River.